Lofts are apartments resulting from the conversion of former industrial or commercial buildings. They have their origins in the New York of the 1950s. At that time, artists and bohemians in search of cheap places to live and work began to move into abandoned late-nineteenth-century buildings that had once been warehouses, workshops or factories, thus creating a new American version of the Parisian artist&apos;s atelier. Nowadays, the tendency to convert warehouses and factories into homes has extended everywhere. Once low-cost living spaces for artists, often occupied illegally by students, they have grown into elegant, luxurious residences reserved for a wealthy elite. 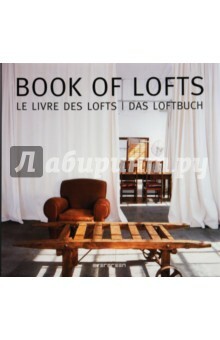 This book describes 55 lofts from all over the world, occupying buildings ranging from huge industrial spaces to small business premises. It is illustrated by more than 600 photographs, architectural plans and computer graphics. Издание на английском, французском и немецком языках.